Most good things in life aren’t available for free, i.e. most, but not all! SlideModel is offering its new and existing users with the opportunity to download premium quality presentation slides for free by downloading our Free PowerPoint Slide Bundle. All you have to do is to sign up for a free SlideModel account or login with an existing one to download this awesome slide set with premium quality content. The slides in this premium quality PowerPoint slide bundle have been combined by various PowerPoint Templates at SlideModel. This collection includes editable diagrams, charts, comparison slides, timelines slides, as well as slides for making professional business models like a SWOT Analysis or Product Lifecycle. 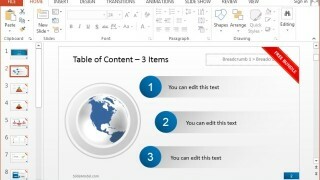 What makes these slides unique is the fact that even minor objects within templates can be easily edited using Microsoft PowerPoint. For example, the slide shown below can be customized by rearranging, recoloring and resizing the given clipart images. This slide set contains special slides for business presentations, with creative designs and business themed clipart. 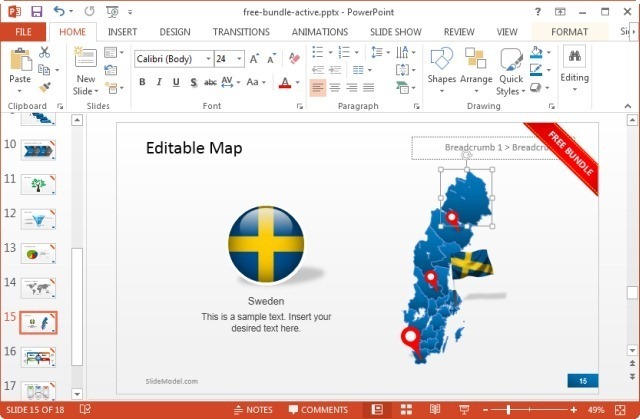 Similarly, you can extract major regions of Sweden from this Sweden Map slide via drag and drop. If you are looking for similar editable PowerPoint Maps for your country or continent, then see our collection of PowerPoint Map Templates. 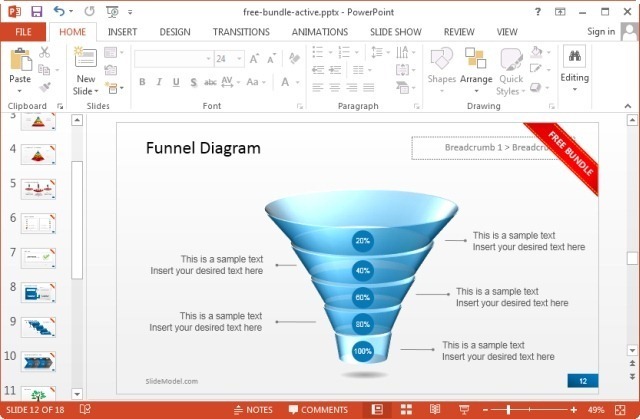 One of the highlights of this free bundle is the availability of a plethora of free editable diagrams for PowerPoint. With the help of these diagram slides you can create anything from pyramid or funnel diagrams to generic diagrammatic models for your presentations. 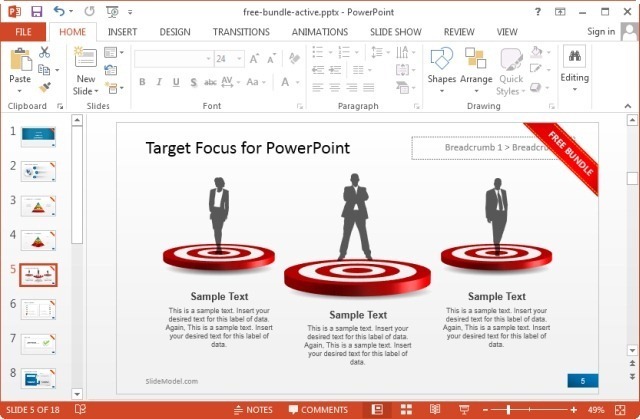 You can also see our complete range of PowerPoint Diagram Templates to find editable diagram models for your presentations. 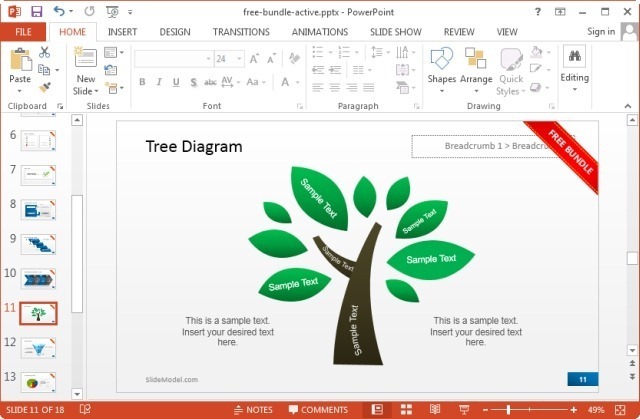 This free slide bundle contains multiple chart, table and timeline slides, as well as slides suitable for making tree diagrams and mind maps. You can easily adjust the elements in such slides to match your needs or simply add text to placeholders to create professional looking charts, tables, timelines, mind maps and more. This Free PowerPoint Bundle is just one of thousands plus PowerPoint templates & slide designs that you can download at SlideModel. 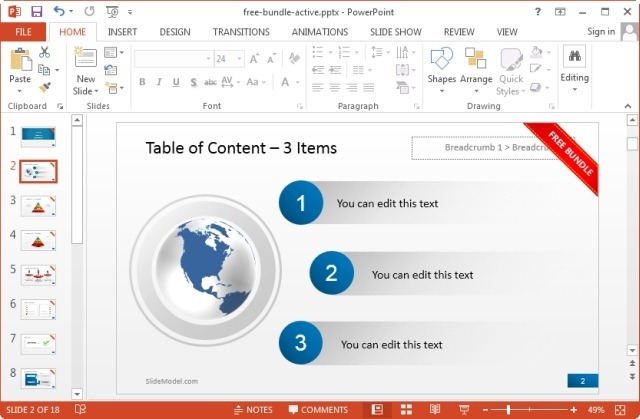 This free bundle for Microsoft PowerPoint does not require you to sign up for any paid subscription, however, if you find this free slide set useful, you can browse through our infinite catalogue of PowerPoint template to download premium content for your presentations.